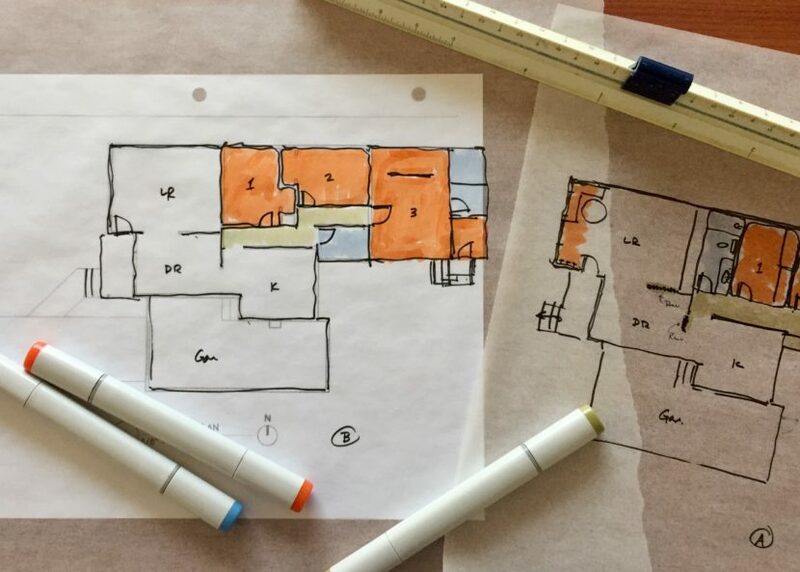 If you haven’t read Part 1 in “Evolution of a Remodel” you may want to do so. In this Part 2, I want to show how we changed our design to get to a price we needed that fit our overall goals for this house and for our lives. I solicited bids from a few trusted contractors. This involves preparing a fairly complete set of drafted drawings and then getting a walk-through from the contractor so that they can ask questions, confirm scope and get a sense of the level of detail and quality that will go into a project. I find that getting my clients to this point is the most confusing part of the process. The more detail we give to the contractor, the more likely it will be that their initial estimate matches their final bid. But many of my clients are loathe to spend money to get the design and drawings to that level if they ultimately can’t afford the project. I will say this – while it is self-serving, it’s also true – the money you spend up front to put your ideas on paper is cheap money compared to what you will spend on most home remodeling projects and getting an accurate price can save a lot of heartache. Secondly, doing your own financial investigation ahead of time to see what resources you will have and how much of them you’ll want to tap is very important. If I know the range of your intended investment, I can steer you to the kinds of solutions that will fit that budget. If you are up front with your contractor about price, they can do the same. How much will it cost vs. how much do you have to spend can seem like kind of a chicken-and-egg conundrum but the takeaway is this: do your homework so you know what your range is otherwise you may end up disappointed and discouraged. We had looked into our various financing options and already had a sense, depending on which financial instrument we chose, where our financial ceiling was. We were also talking intently about how much to invest in our home. What’s worth it and what is not? Is this our “forever house”? What kind of return can we hope for by making these improvements? Hard questions with not always clear answers. What came back were bids that were fairly close together, though with about a $50k range in them depending on what the contractors chose to call out and put in hard numbers. I made a spreadsheet to compare – it was incredibly difficult as there is such variation in how contractors format their bid. Some do bigger “buckets” of numbers than others. Where we saw big discrepancies between them, we dug in and asked questions to try to figure it out. This can be a tedious process. I’m going to speak in very general numbers here, some bids were higher, some lower but just remember my project is not your project. You can think of these numbers as more relative to each other than absolute costs. Let’s say the bids came back at around $200,000. Staggering? Maybe. Let’s assume that we have padded the estimates with some extras – painting the whole house, replacing the driveway, replacing all windows. But let’s try to break down the costs. ceiling issues – my ceilings have this squared cove that I see a lot of in Portland and so we either needed to remove it and do something else or try to work with it (more complexity) but let’s just say, new ceiling in both living and dining! Crazy, right? Let’s call the price for the front of house work somewhere between $20-30k. what else? I think that’s enough to consider…. Let’s call this cost $15-$25k. There’s some savings in that we already have the plumbing lines, they are in good shape, etc.. And we aren’t pouring a new foundation or anything like that. But, here’s a third major cost to consider in this scenario that is not part of the bid…. You just can’t do this level of gut and remodel and stay in your home. We have no finished basement to retreat to and at some point pretty quickly, every room other than the kitchen was going to be a total mess. At some point, we would have no bathrooms. You absolutely need to find another place to live for something like this. For the current rental market in Portland, even finding a place would have been tough and renting would have been expensive. I had mentally earmarked $2k/mo for a rental and then there’s storing over half your stuff somewhere, moving the other half into the rental and don’t forget, you’re still paying on your house. For my clients who have done major projects, a few have been lucky enough to have family in the area who can put them up. A few have had “snowbird” parents who just vacate their local house for a few months and what an ideal situation that is! A few have rented places and just gutted through that. It’s a lot to take on and there’s always the uncertainty of exactly how long you’ll be displaced. So, let’s say the cost of that is $10-15k alone. Let’s be optimistic. When you don’t like the price your contractor has offered you, you need to do some figuring. You can go to them and say, “It’s too high…” and they’ll say, “Well, it’s your project….” You definitely can and should dig in on their numbers and see if any assumptions were made that were incorrect but you also need to look at your finances, weigh the relative worth of the project and its parameters, and probably find a way to reduce the scope. For us, we really agonized on the relative worth of what we were asking. Ultimately, the deciding question for us was: Is this the house we are planning to retire in? Is this our forever house? Because if it is, maybe we find a way to go the distance. However, we were leaning away from that. So we boiled it down to our minimal needs. What do we need to enjoy this house for the next five to ten years? What makes the value of this house go up? What will a future buyer pay money for and what will they not even notice? First, we ditched the whole front half of the house project. Just threw it out. It would have been so awesome but I just can’t spend tens of thousands of dollars to have a place to hang my jacket and it’s something no buyer would ever really notice. Other than square footage, it adds nothing to the “value” of the house. Next was trickier – can we avoid moving the bathroom? The existing bathroom is small but it’s functional. It looks good and has a nice window. Many sketches later, I came to a realization – if we leave the kid’s bedroom and the main bathroom intact, we could likely stay in the house during the project. Beyond the money, the psychological stress of moving out was already weighing on me. The notion of packing the whole house and putting into storage and….ugh. It just made me want to crawl into a hole. So not having to do that just thrilled me. 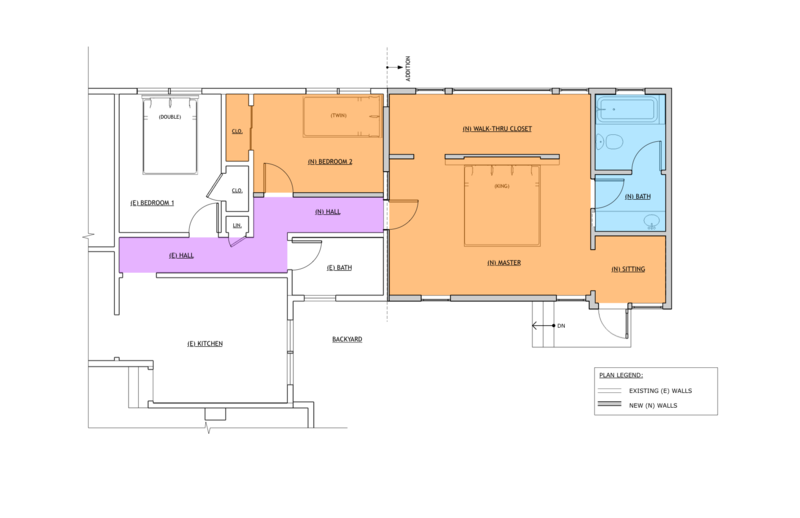 So I kept plugging away at the design, making it more and more minimal in its impact on the existing house and actually coming up with a master bedroom layout that really felt like it fit what we wanted and worked very well. 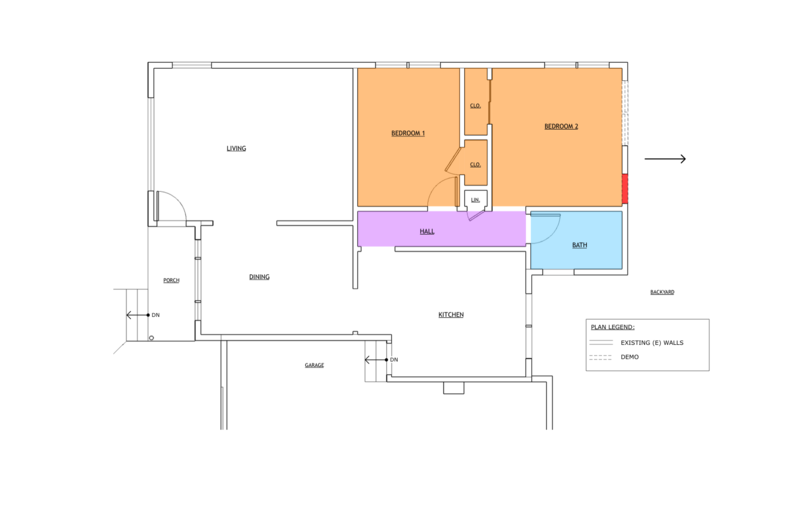 Ultimately, we decided to make one major move to the existing house which is to add a wall to our current master bedroom that will join the main hall to the new addition. What this leaves behind is one bedroom completely untouched, my kid’s room. It’s a small room, fine for a twin bed but anything larger and you do start to fill the space. What I had wanted was to be able to comfortably fit a queen bed in here with room for nightstands and a full closet. That way, if we had guests we could kick her out to camp on our floor and they would have a comfortable space. Maybe instead we leave it alone and get her a trundle bed or maybe a full bed and see how that goes? By not moving the interior walls, we didn’t mess up the hardwood floors and require a ton of patching or new flooring. By not moving the interior walls, we didn’t mess up the alignments of the existing windows. Initially, we planned to replace all the windows in the house but as we started throwing things out of the project, retaining the existing windows was something we decided to do. By not altering all the closets, we don’t need to get a bunch of new closet doors – it all adds up. We have it sized for a king bed (yay!) and there is some design work on the headboard wall that I’m pretty stoked about. There’s a walk-through closet behind the headboard wall where I’ll install an ELFA closet system. I’m thinking of a Sputnik chandelier in there. My husband will get the “small” closet to the left and I’m claiming the vast expanse in the center. We have shared a single 6′ wide closet for ten years! You make it work but I’m looking forward to having more storage. Off the new back door will be a tiny platform deck with two stairs down to the backyard and that little corner has become one of my favorite spaces. I’m so excited to see how it turns out! Insulate the existing walls (TBD). So, overall, our price is about half what it was and we feel like these changes work for us and add the right value to the house for the near and long term.